Alfredo LLamedo protests outside Spokane City Hall. For years, homeless activists have consistently attended Spokane City Council meetings and pleaded with the council to repeal the city's sit-and-lie law, which bans sitting or lying down in public downtown when there's open shelter space. Last week was no exception: Homeless veteran Henry Valder draped a sleeping bag over his shoulders and held an American flag upside down in front of his face before talking about the plight of the homeless. Activists projected the words "Sit Down Spokane" on the wall of the City Council chambers. 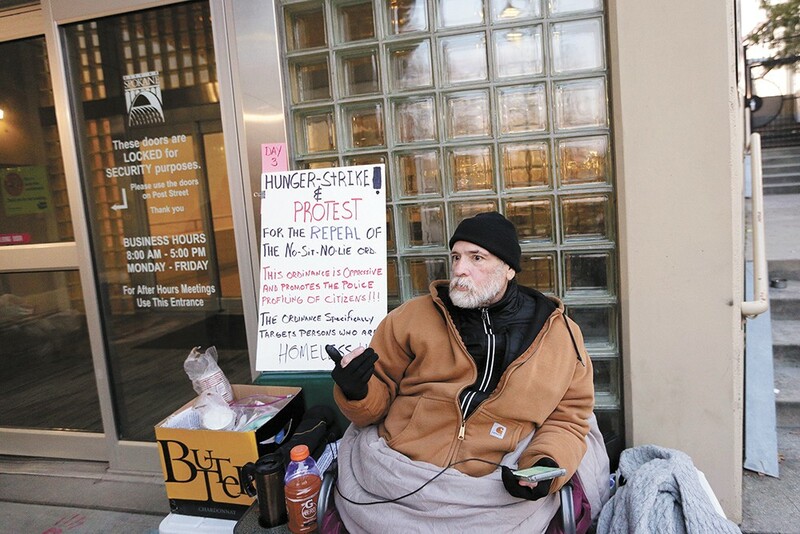 Activist Alfredo LLamedo kicked off a hunger strike that night outside of City Hall to protest the sit-and-lie ordinance. Indeed, City Council President Ben Stuckart joined council members Kate Burke and Breean Beggs last week in signing a letter requesting that the mayor temporarily suspend the ordinance until more shelter beds could be found. Burke and Beggs want to go further: They want to permanently repeal or alter the ordinance. Back in 2013, Stuckart was an ardent opponent of the ordinance, arguing there was little evidence from other cities of the laws' effectiveness and that "the first time we apply this law and there is zero capacity in our shelters, we are violating the Eighth Amendment." But over the next few years, Stuckart changed his mind, arguing the ordinance had given the police a tool they needed to respond to concerns downtown. "It really did lessen the problem," Stuckart told the Inlander this summer. "I'm not going to vote to overturn the sit-and-lie law, unless somebody else comes up with a [better] solution that the city has implemented." In a text message, Stuckart confirmed he was still not in favor of a permanent repeal. He argues that the sit-and-lie law helps connect homeless people with services through the city's community court. But Councilman Beggs argues that there are more effective, less expensive and less constitutionally risky ways to connect people with services than community court. He wants to focus on specific behaviors — like blocking sidewalks, vandalism or harassment — instead of just barring sitting on the ground downtown. "We need more police presence downtown and we need more shelters," he says. And the sit-and-lie law, he says, doesn't help with either. The original print version of this article was headlined "Not Sitting Down"